The science that treats of the measurement of quantities and the ascertainment of their properties and relations. The necessity of studying astronomy for calendric purposes caused the ancient Hebrews to cultivate various branches of mathematics, especially arithmetic and geometry, applications of which are frequent in the Mishnah and Talmud. With regard to arithmetic there occur the four rules, in both whole numbers and fractions; even the decimal system is alluded to by Rabba, who says that the Persians called the number 10 "one" (Ber. 60a). As to geometry, the treatises 'Erubin, Kelim, Ohalot, etc., contain many applications of planometry and stereometry. The terms "bigon," "trigon," "tetragon," and "pentagon" are found several times in the Talmud, both in their geometrical sense, signifying a figure of two, three, four, or five angles, and in their arithmetical sense, expressing the numbers 2, 3, 4, and 5. As early as the forty-ninth "middot" of R. Nathan 3 1/7 to 1 is given as the relation between the circumference and the diameter of a circle. The names which occur often in the Talmud in connection with mathematical propositions are Gamaliel, Joshua, Judah, and Samuel. 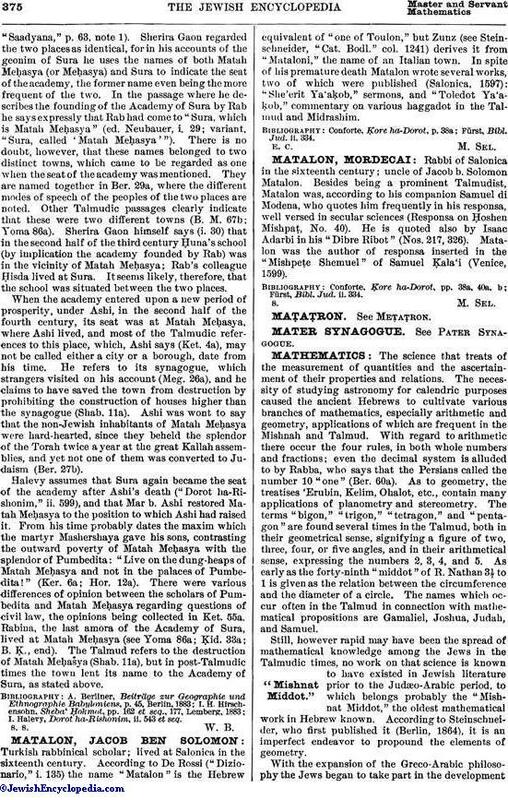 Still, however rapid may have been the spread of mathematical knowledge among the Jews in the Talmudic times, no work on that science is known to have existed in Jewish literature prior to the Judæo-Arabic period, to which belongs probably the "Mishnat Middot," the oldest mathematical work in Hebrew known. According to Steinschneider, who first published it (Berlin, 1864), it is an imperfect endeavor to propound the elements of geometry. With the expansion of the Greco-Arabic philosophy the Jews began to take part in the developmentof mathematics, which was regarded as a science introductory to philosophy. It was divided by the Arabian school into seven "disciplinæ"; namely, arithmetic ( ), algebra ( ), geometry ( or ), astronomy ( ), astrology ( ), optics ( ), and music . Of these only algebra and geometry are treated at length in this article, the others being dealt with under their respective names. With the exception of the above-mentioned "Mishnat Middot," no work on algebra or geometry is known to have been written in Hebrew before the twelfth century; the few writings composed by Jews in these branches of mathematics, which in the Middle Ages were neglected in favor of astronomy and astrology, were in Arabic. The oldest Jewish writer on mathematics in its strict sense was the renowned astrologer Mashallah (more correctly Ma Sha Allah), who flourished at the end of the eighth century and at the beginning of the ninth. A contemporary of his, Abu Othman Sahl ibn Bishr ibn Ḥabib ibn Ḥani, was the author of a work on algebra entitled "Al-Jabar wal-Muḳabalah." Another work on algebra, bearing the same title, and a commentary on the "Elements" of Euclid, were written about the same time by a Jewish convert to Islam, Sind ben 'Ali. To the same period belongs Sahl Rabban alṬabari, who was considered one of the greatest geometers of his time. Among the writers of the tenth and eleventh centuries mention should be made of Bishr ben Phinehas ben Shu'aib and Jacob ben Nissim of Kairwan, the latter of whom wrote, under the title "Ḥisab al-Ghubar" (Hebr. ), a work on Indian mathematics. In the twelfth century works on algebra and geometry began to appear in Hebrew, mainly as translations from the Arabic. The first known Hebrew writer on geometry was Abraham bar Ḥiyya ha-Nasi, who expounded its elements in a work entitled "Ḥibbur ha-Meshiḥah weha-Tishboret." This work, which probably formed a part of his encyclopedia "Yesode ha-Tebunah we-Migdal ha-Emunah," was edited by Steinschneider in the publications of the Meḳiẓe Nirdamim Society (1895, vol. xi.). A Latin translation of Abraham bar Ḥiyya's work was made about 1136 by Plato of Tivoli. Another prominent writer on geometry in that century was Samuel ibn 'Abbas, who, at the request of Sultan Abu al-Fatḥ Shah Ghazzi, composed in Arabic a work on the difficulties encountered by the geometer. As a translator of astronomical and mathematical works from the Arabic into Latin, in the same century, the Jewish convert known by the name of Johannes Hispalensis was distinguished. An English Jew is said to have written in Latin, in 1190, a work on mathematics under the title "Mathematica Rudimenta Quædam." The thirteenth century was especially rich in mathematical productions. The writings of the Greek and Arabian mathematicians were translated into Hebrew and commented upon. 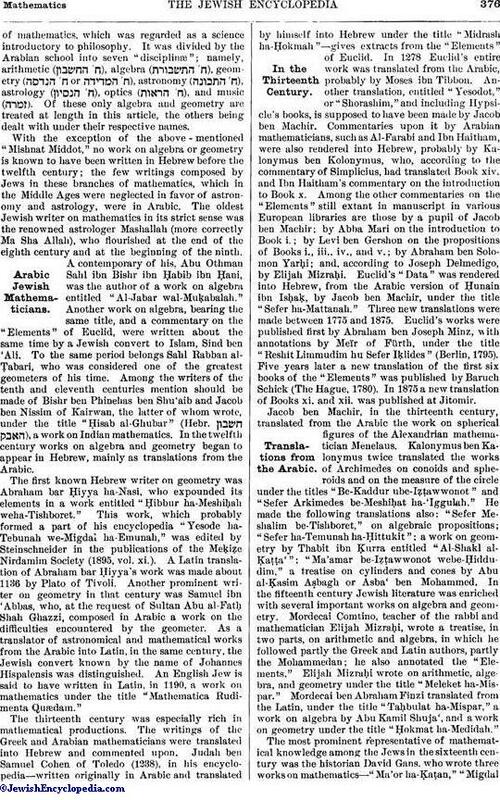 Judah ben Samuel Cohen of Toledo (1238), in his encyclopedia—written originally in Arabic and translated by himself into Hebrew under the title "Midrash ha-Ḥokmah"—gives extracts from the "Elements" of Euclid. In 1278 Euclid's entire work was translated from the Arabic, probably by Moses ibn Tibbon. Another translation, entitled "Yesodot," or "Shorashim," and including Hypsicle's books, is supposed to have been made by Jacob ben Machir. Commentaries upon it by Arabian mathematicians, such as Al-Farabi and Ibn Haitham, were also rendered into Hebrew, probably by Kalonymus ben Kolonymus, who, according to the commentary of Simplicius, had translated Book xiv. and Ibn Haitham's commentary on the introduction to Book x. 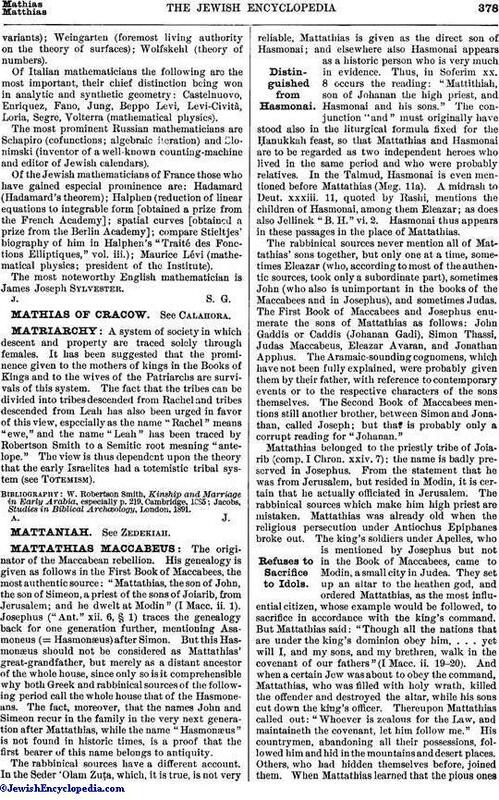 Among the other commentaries on the "Elements" still extant in manuscript in various European libraries are those by a pupil of Jacob ben Machir; by Abba Mari on the introduction to Book i.; by Levi ben Gershon on the propositions of Books i., iii., iv., and v.; by Abraham ben Solomon Yarḥi; and, according to Joseph Delmedigo, by Elijah Mizraḥi. Euclid's "Data" was rendered into Hebrew, from the Arabic version of Ḥunain ibn Isḥaḳ, by Jacob ben Machir, under the title "Sefer ha-Mattanah." Three new translations were made between 1775 and 1875. Euclid's works were published first by Abraham ben Joseph Minz, with annotations by Meïr of Fürth, under the title "Reshit Limmudim hu Sefer Iḳlides" (Berlin, 1795). Five years later a new translation of the first six books of the "Elements" was published by Baruch Schick (The Hague, 1780). In 1875 a new translation of Books xi. and xii. was published at Jitomir. Jacob ben Machir, in the thirteenth century, translated from the Arabic the work on spherical figures of the Alexandrian mathematician Menelaus. Kalonymus ben Kalonymus twice translated the works of Archimedes on conoids and spheroids and on the measure of the circle under the titles "Be-Kaddur ube-Iẓṭawwonot" and "Sefer Arkimedes be-Meshiḥat ha-'Iggulah." He made the following translations also: "Sefer Meshalim be-Tishboret," on algebraic propositions; "Sefer ha-Temunah ha-Ḥittukit"; a work on geometry by Thabit ibn Ḳurra entitled "Al-Shakl alḲaṭṭa'"; "Ma'amar be-Iẓṭawwonot webe-Ḥiddudim," a treatise on cylinders and cones by Abu al-Ḳasim Aṣbagh or Asba' ben Mohammed. In the fifteenth century Jewish literature was enriched with several important works on algebra and geometry. Mordecai Comtino, teacher of the rabbi and mathematician Elijah Mizraḥi, wrote a treatise, in two parts, on arithmetic and algebra, in which he followed partly the Greek and Latin authors, partly the Mohammedan; he also annotated the "Elements." Elijah Mizraḥi wrote on arithmetic, algebra, and geometry under the title "Meleket ha-Mispar." Mordecai ben Abraham Finzi translated from the Latin, under the title "Taḥbulat ha-Mispar," a work on algebra by Abu Kamil Shuja', and a work on geometry under the title "Ḥokmat ha-Medidah." , a new translation of Euclid, by Baruch Schick. The Hague, 1780.
, on Books xi. and xii. of the "Elements," by David Friesenhausen. Jitomir, 1875.
, containing, among other scientific dissertations, treatises on arithmetic, algebra, geometry, and trigonometry, by Joseph Delmedigo. Amsterdam, 1629.
, arithmetic, in Judæo-German, by Faibus Hurwitz. Amsterdam, 1791.
, on the geometrical propositions found in the Talmud, by Tobias Hurwitz. Prague, 1807.
, arithmetic, according to Elijah Mizraḥi and non-Jewish sources, by Abraham Niederländer. Prague (1609?). , arithmetic, by Jehiel Michael Epstein. Wilna, 1836.
, arithmetic, by Moses Ḥayyim Eisenstadt. Dyhernfurth, 1712.
, arithmetic and algebra, by Naḥman Hirsch Linder of Dubno. Warsaw, 1855.
, arithmetic, translated from the French by Jacob Eichenbaum. Warsaw, 1857.
, arithmetic, in Judæo-German, by Aryeh Löb Shames. Amsterdam, 1690.
, geometry, by Gabriel Judah Lichtenfeld. Warsaw, 1865.
, containing, among other things, geometrical propositions, by Baruch Schick. Berlin, 1777.
, on the various branches of mathematics, by Ḥayyim Zelig Slonimski. Jitomir, 1865.
, algebra, by David Friesenhausen. Berlin, 1797 (Zolkiev, 1835). , logarithms, by David Friesenhausen. Königsberg, 1854.
, arithmetic, by Letableau. Warsaw, 1866 (ib. 1875). , proofs on the eleventh proposition of Euclid, by David Friesenhausen. Vienna, 1820.
, arithmetic, by Moses Samuel Neumann. Vienna, 1831.
, arithmetic and algebra, by Elijah ben Gershon of Pintschow, Zolkiev, 1740.
, in two volumes: the first, entitled , deals with arithmetic and the elements of algebra; the second, , treats of geometry, by Gershon Elias. Berlin, 1765 (Frankfort-on-the-Oder, 1766; Ostrog, 1806). , arithmetic, in Judæo-German, by Goldenberg. Berdychev, 1823 (Sdilkov, 1834). , on all branches of mathematics, in three volumes, by Shalom Blenker. Berdychev, 1834.
, arithmetic, algebra, and geometry, by Elijah Mizraḥi. Constantinople, 1534.
, algebra, by Asher Anshel Worms. offenbach, 1722.
, geometry and trigonometry, by Simeon Waltsch. Berlin, 1786.
, arithmetic, by Menahem Zion Porto. Venice, 1627.
, on the mathematical propositions found in the Talmud, by Jacob Kopel. Cracow, 1598 (Amsterdam, 1710). , dissertations on geometry, by Kopel Shacherles. Vienna, 1814.
, criticisms on the mathematical works of Ḥayyim Zelig Slonimski, by Gabriel Judah Lichtenfeld. Warsaw, l874. , arithmetic and algebra, by Joseph Schliffers. Wilna-Grodno, 1827.
, trigonometry, by Baruch Schick. Prague, 1784.
, a commentary on the "Elements," by Abraham Joseph Minz. Berlin, 1775.
, on the calendar, and on arithmetic and geometry, by Elijah Hechim. Warsaw, 1863.
, logarithms, by Rabinowitsch. St. Petersburg, 1872.
idem, Die Arabische Literatur der Juden. The number of mathematicians of Jewish origin in the nineteenth century is so great that a detailed list of all could hardly be given here. As there are, moreover, no data regarding the lives of the French, English, and Russian mathematicians the biographer frequently would be obliged to resort to conjecture. For example, it is believed that Lobatschewski, one of the discoverers of absolute geometry (pangeometry), was the son of Jewish parents, since his father, a native of Poland, is known to have been converted to the Orthodox Greek Church, and conversion from Catholicism is not likely. Similarly, the ancestry of the great astronomer Friedrich Bessel calls for investigation. 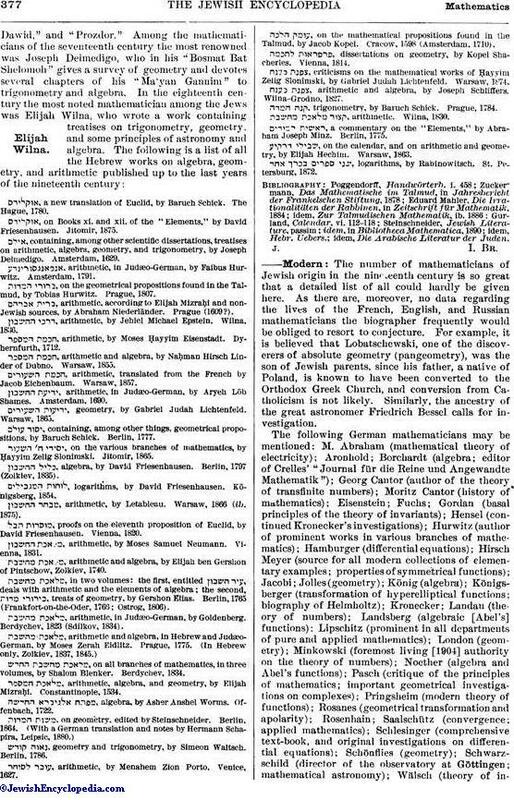 The following German mathematicians may be mentioned: M. Abraham (mathematical theory of electricity); Aronhold; Borchardt (algebra; editor of Crelles' "Journal für die Reine und Angewandte Mathematik"); Georg Cantor (author of the theory of transfinite numbers); Moritz Cantor (history of mathematics); Eisenstein; Fuchs; Gordan (basal principles of the theory of invariants); Hensel (continued Kronecker's investigations); Hurwitz (author of prominent works in various branches of mathematics); Hamburger (differential equations); Hirsch Meyer (source for all modern collections of elementary examples; properties of symmetrical functions); Jacobi; Jolles (geometry); König (algebra); Königsberger (transformation of hyperelliptical functions; biography of Helmholtz); Kronecker; Landau (theory of numbers); Landsberg (algebraic [Abel's] functions); Lipschitz (prominent in all departments of pure and applied mathematics); London (geometry); Minkowski (foremost living  authority on the theory of numbers); Noether (algebra and Abel's functions); Pasch (critique of the principles of mathematics; important geometrical investigations on complexes); Pringsheim (modern theory of functions); Rosanes (geometrical transformation and apolarity); Rosenhain; Saalschütz (convergence; applied mathematics); Schlesinger (comprehensive text-book, and original investigations on differential equations), Schönflies (geometry); Schwarzschild (director of the observatory at Göttingen; mathematical astronomy); Wälsch (theory of invariants);Weingarten (foremost living authority on the theory of surfaces); Wolfskehl (theory of numbers). Of Italian mathematicians the following are the most important, their chief distinction being won in analytic and synthetic geometry: Castelnuovo, Enriquez, Fano, Jung, Beppo Levi, Levi-Cività, Loria, Segre, Volterra (mathematical physics). The most prominent Russian mathematicians are Schapiro (cofunctions; algebraic iteration) and Slonimski (inventor of a well-known counting-machine and editor of Jewish calendars). Of the Jewish mathematicians of France those who have gained especial prominence are: Hadamard (Hadamard's theorem); Halphen (reduction of linear equations to integrable form [obtained a prize from the French Academy]; spatial curves [obtained a prize from the Berlin Academy]; compare Stieltjes' biography of him in Halphen's "Traité des Fonctions Elliptiques," vol. iii. ); Maurice Lévi (mathematical physics; president of the Institute). The most noteworthy English mathematician is James Joseph Sylvester.